Congratulations, Justin! Last night, Justin was honored with the most prestigious award from the iHeartRadio Music Awards: The 2015 iHeartRadio Innovator Award! The experience was one for the history books - from the star-studded tribute video to Justin's moving acceptance speech. The iHeartRadio Music Awards broadcasted live and aired on NBC Sunday, March 29 from the historic Shrine Auditorium in Los Angeles. As millions watched, the one and only Tom Ford presented the award to our #PresidentOfPop. Tom Ford articulated it perfectly, "There are but a few entertainers who have the talent to truly endure. And within that very small group, only the most gifted and innovative have the willingness to take risks, the drive to try constantly try new things, and the ability to transcend all artistic boundaries. That defines Justin Timberlake." 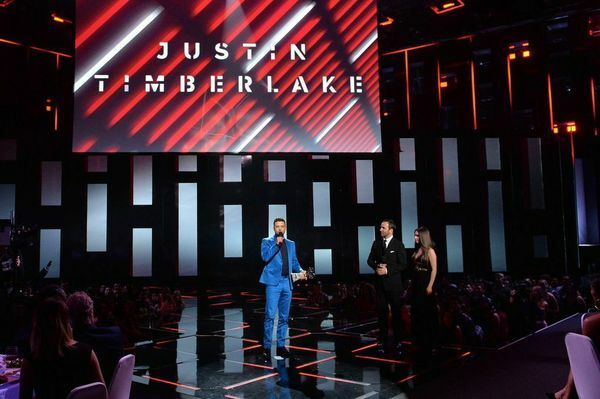 A video tribute to JT played before he was presented with the award in which Pharrell Williams, Timbaland, Neil Barrett, Trace Ayala, Jimmy Fallon, Andy Samberg, Lorne Michaels, Taylor Swift, Rick Rubin, Marty Kudleka, and Johnny Wright celebrated his work and dedication to his craft. JT accepted the award with a moving speech quoting Steve Jobs stating, "Stay foolish. Stay hungry. Dream. Work hard." Watch his full acceptance speech below. What a night. What an honor. What an innovator. Way to make history! Well said JT. We are so proud of you. ps. You're not that old. You're just older than many many many many people on earth. I listened to the speech you gave about sharing your gifts with the world & not being afraid of what other people may say, and posted my Boston Stronger video as a result. In the past 24 hrs. 3,000+ people have watched my video & it has now been shared with the bombing survivors, their families, the first responders, and the City of Boston. Please help me to share it with the rest of the world. This video is about the power and resilience of the human body and spirit. This is for the families effected by the tragedy, for the first responders, for the citizens of Boston, and for the runners preparing to race in 2015.
im so proud to be part of #JTFAM! i dont know what to sya about this speech. Justin you made me cry!! i freken love you and miss you so much you dont know how this event gave me hope,love,relexing and thinking about whats going on now what i need to do what is my life waht good to me what bad to me what i love about what i care about who care about i dont stop to say to you Justin!!!! THANK you!!!! i wirth this post with litlle tears becuse every time that i see you on tv on event,show,the news about you you always changes smothing in me and this chenges always help me to get level up to grow to lern from my mistakes and every time that i lernd from that i just kiss your photo and say THANK YOU Justin!! that you heles me all the time and help me that why i LOVE YOU exsept from your music you an a amazing man! i love Justin forever!!! You deserve it. So proud of this amazing man! Very proud to say that I am a fan of such a great person with such a great personality! Congrats for last night and for your little baby! I'm proud to say I've been a fan for 20 years. It all started with MMC and look at where you are now. JTFAM is so proud of you!! Your speech was everything and it made me cry and smile all at the same time. Congrats Justin you completely deserve this!! Congratulations on this unbelievable achievement. You deserve it. Keep being who you are! I've been a huge fan for over 17 years now and I will always be. Thank you for your amazing music and everything you do. Oooh and another congratulations for your little bundle ariving soon! Sending love from NH. Lexy K.